Feel free to email us questions at info@wendell.com and we will typically respond within 24 hours. We will do our best to respond even more quickly. How long has Wendell August been in business? Wendell August was started in Brockway, Pennsylvania in 1923. In 1932, at the urging of a friend, Mr. August moved his company to Grove City, Pennsylvania After a devastating fire in 2010, we moved just off the Grove City exit to nearby Mercer, Pennsylvania. Can you help me with personalization/engraving questions? Please visit our Personalization page. At Wendell August, we craft our giftware in six different metals: aluminum, bronze, copper, pewter, stainless steel and sterling silver. What do the different metals consist of? Why don't all the products come in bronze too? The number of products offered on Bronze is limited by cost and end use. Our Bronze giftware is covered with lacquer finish to prevent the piece from tarnishing. This coating will be damaged if subject to heat (especially hot water) and chemicals and will tarnish if compromised. Therefore the Bronze is best used with a tray protector or as display only. We operate three Wendell August retail stores with a complimentary workshop tour at our Flagship store and a simulated tour at our Holmes County store. There is also a location at the Grove City Premium Outlets in Grove City, PA 16127. We have select products available at retailers throughout the United States. Please visit our Locations page. I have an older piece of Wendell August; can you tell me the value? We are unable to formally appraise the value of our older pieces. However, many of our Wendell August antique pieces are purchased and sold through online web auctions by antique aluminum collectors, which should give you a sense of the current secondary market value. Online purchases will be charged to your credit card when the order is placed. Can I pay for online purchases with a check or money order? Currently Visa, MasterCard, Discover, American Express and Paypal are the only acceptable forms of payment for your online purchases. How do I know my credit card number will be safe on the Internet? We take seriously the security for all personal and non-personal information associated with our visitors and customers. We use Secure Socket Layer (SSL) encryption technology. Yes, but sales tax will only be charged on shipments to Ohio and Pennsylvania. Why do I have to pay sales tax on items and on shipping? Wendell August has retail and workshop operations located in both Ohio and Pennsylvania. Therefore, sales tax is applied to items shipped to these two states and is based on their individual sales tax rates. Sales tax is also calculated on shipping charges in Pennsylvania because it is, by law, a taxable service. Can I pay for online purchases with a Wendell August Gift Card? No. You may purchase a Gift Certificate that can be used to order on the website. A Gift Card is only redeemable by visiting any of our three company stores or over the phone by calling 1-800-923-4438. My organization is Tax Exempt, can I place an order online and have the tax removed? No. Our website will always calculate tax on your order and transfer into our ordering system with tax intact. To place an order for a Tax Exempt organization, please call the Customer Service Manager at 1-800-923-4438. You will need to provide your Tax Exempt forms, she will set up an account for your organization and place your order over the phone. Can I phone, fax or mail my order? Our phone number is 1-800-923-4438, Monday through Saturday from 8:00 am - 6:00 pm, and Sunday 12:00 pm - 5:00 pm (Eastern Standard Time). Our fax number is 724-748-0182, any time day or night. Whom do I contact if I have a question or problem or need to call customer service? For your convenience, you may email us at info@wendell.com. One of our representatives will look into your request and provide an email response within 24 hours. Or you may contact our Customer Care team at 1-800-923-4438, Monday through Saturday 9:00 am - 5:00 pm and Sunday 12:00 pm - 5:00 pm (Eastern Standard Time). How can I get information about business gifts and awards? We work with distributors nationwide who represent us and can work directly with you to create a world class solution for your need. Please see our Corporate Sales web site, call us at 1-800-923-1390, or email us at custominfo@wendell.com and we will put you in touch with the distributor in your area. Is my Wendell August item "food safe"? Absolutely! We like to say "food safe, from preparation to clean-up". As you are getting ready to eat or entertaining friends and family, your Wendell August item is ready for the event as well! When your meal or celebration is over, just clean your item per the instruction below. If you'd like to cut on your WA ware, please only do so if you have a tray protector, sold separately. Cutting directly on the piece will add a deep gash to the metal that most likely will be permanent. Also, don't cook in your Wendell August item but you can chill in it. Dishwashers are a no-no as well. Please see our Product Care section on this page. How do I care for my jewelry purchase? Please download our Jewelry Product Care guide. Does the web site carry everything your catalog and gift shops do? The website carries only IN STOCK items. The Gift Stores carry EVERYTHING plus an extensive Complementary inventory. We carry a very comprehensive product catalog on our web site and are adding new products constantly. What if I find a product online but would like a different design or metal? We will be delighted to service your customized needs. Please contact us at 1-800-923-4438, Monday through Saturday 9:00 am - 5:00 pm and Sunday 12:00 pm - 5:00 pm (Eastern Standard Time), and we will be happy to assist you. Do you ever retire a piece? Yes. Periodically we will introduce a limited edition collection. These collections are limited by length of time or the number of pieces produced. After the edition is closed, the design is retired. How may I obtain, or sell, a retired piece? Since these items are part of our limited edition collection, they are no longer in production and unfortunately, can no longer be ordered. You may be able to locate some of our earlier pieces through online web auctions and possibly collector publications. May I place an order online and pick it up at one of your retail stores? Currently all orders placed online are shipped directly to you from our workshop near Grove City, PA. If you wish to pick up an order in one of our retail stores, your order must be placed with that store directly. We hope that you are completely satisfied with your Wendell August purchase and your satisfaction is our primary concern. We will gladly exchange, credit, or refund your purchase price should any stock item fail to meet expectations. Simply return the item in new, unused condition within 90 days accompanied by your proof of purchase receipt. Jewelry needing repairs within 120 days of purchase, will be done at no cost to the customer. Contact customer service for pricing on repairs for jewelry more than 120 days from purchase. Custom order products or engraved products are not returnable. Before ordering product with engraving, pay special attention that the engraving information is accurate. Because each of our pieces are handcrafted and we strive to ship them to you very quickly, we are unable to change engraving once the order is placed. Shipping charges are non-refundable. Wendell August makes every effort to ensure that shopping with us is a safe and enjoyable experience for our customers. To ensure the maximum level of security, our web site is hosted on secure servers and utilizes Secure Socket Layer (SSL) encryption technology. This technology ensures that your personal shopping information (credit cards, phone numbers, addresses, etc.) is protected when transmitted over the Internet to our server. If you’re still concerned about ordering electronically, you may place your order by phone at 1-800-923-4438, Monday through Saturday 9:00 am – 5:00 pm and Sunday 12 am – 5 pm (Eastern Standard Time). In Stock Items: Generally, any of the items featured on our site are in stock and usually ship within 1 business day. Personalized/Engraved Items: Personalized/Engraved Items usually ship in 5-7 business days. Standard Shipping Lead Times: We ship our orders via FedEx Ground Service or United States Postal Service. If you select Standard Shipping for U.S. shipments (in the contiguous United States), the time your package is in transit will be 3 to 7 business days, depending on where you live. In-stock non engraved items ship the same day if the order is placed before noon Monday through Friday, or will ship the next business day if placed after noon. Saturday orders and Sunday orders placed will ship the following Monday afternoon. So on average, you can expect to receive this item at your door 4 to 10 business days after you place your order. Generally, backordered or engraved items take 5-7 business days to complete, and with the 3-7 days in transit, should arrive in approximately 8 to 15 days. Express Delivery: We offer express delivery service on in stock items for delivery in 1 to 2 days. Please see the Shipping Chart below for orders placed by 12:00 pm. Please phone our Call Center at 1-800-923-4438, Monday through Saturday 9 am - 5:00 pm or Sunday 12:00 pm to 5:00 pm (Eastern Standard Time) to check on availability of items and to assist you in placing your order. 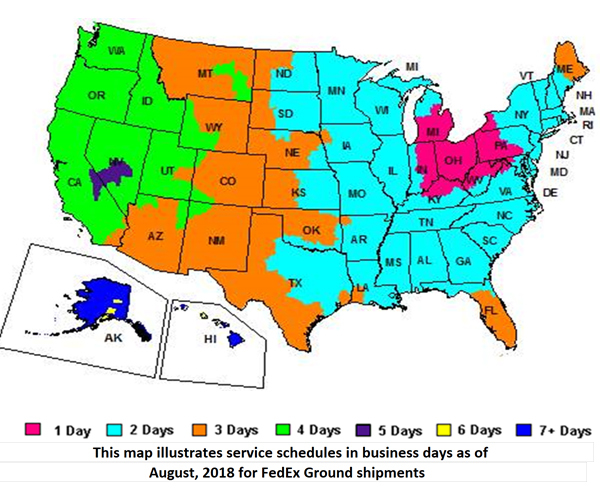 Wendell August ships all packages via FedEx from our fulfillment center located in Mercer, PA. Days represented on the shipping chart below are business days from when we ship your order until it arrives and do not include weekends or holidays. All orders of in-stock and non-engraved products will ship on the date of the order (if before 11:30 AM EST) or the next business day (if after 11:30 AM EST). NOTE: Due to the volume of orders placed on and around the holiday weekend, it may take 3-5 business days to process in stock orders from November though the end of December. This method is Wendell August’s most economical shipping option to choose if you have a little extra time. Economy shipping will work for USPS PO Boxes, APO and FPO addresses. The final leg of this delivery will be done through the USPS. DO NOT USE THIS METHOD IF YOU NEED YOUR ORDER BY A SPECIFIC DATE. This is not a guaranteed service. When using this method, expect shipping times to take 2-5 business days longer than what is represented on the map below. This method is a reliable alternative to the WA Saver shipping method. When using this method, expect shipping times to reflect what is represented on the map below. However, this is not a guaranteed service. This method will have your order delivered two business days from when we ship it from our fulfillment center, but is more expensive. When delivery is urgent select this method to have your order delivered the business day after we ship it from our fulfillment center. All international orders, including Canada must be entered over the phone with our Customer Service Department at 1-800-923-4438. Please call to request a shipping quote. NOTE: Any additional Customs, duties and taxes required by the destination country are the responsibility of the recipient. International Shipping is not subject to any Free Shipping Promotions. Shipping Charges are per ship to address and calculated on order total before any discounts apply. Please call 1-800-923-4438 for international shipping charges. We offer rush service on in stock items for Saturday delivery. Add an additional $25 for Next Day Saturday delivery. Orders must be placed before 12 pm Friday. Please call to confirm product availability. If you are not completely satisfied with the quality of our product, we will gladly exchange, credit or refund your purchase price within 90 days accompanied by proof of purchase as long as the product is in new, unused condition. Custom orders and engraved products are not returnable. Before ordering engraved product, please pay special attention that the engraving information is accurate. Call or email our Customer Service department and request a return form. Complete the form for all pieces that you are returning and include in the box with your return. Address the return as instructed. Make sure that the address label is securely attached on all four sides. Be sure to obliterate any other addressed and barcodes on the outside of the parcel. You may also choose to visit any of our three retail stores. Just bring your merchandise and packing slip to our store for a return or exchange. Use our Store Locator to find the store nearest you. A credit will be issued within 7-10 business days of receipt of the returned item. It may take several days to show up on your account; time varies on a bank by bank basis. The credit will be made using the same payment type as the original transaction. Do I have to pay shipping costs on a returned item that was purchased online? Yes, Return shipping on a standard return is not a reimbursable expense. Does tax get refunded when returning an item that was purchased online? Yes, Wendell August will issue you a credit for any tax paid on a returned item shipped to Pennsylvania or Ohio. Yes, gifts may be retuned based on the same return time limits for either exchange or store credit. Please note that custom and engraved product may not be returned. How do I take care of my Aluminum or Pewter Wendell August piece? We recommend you care for your aluminum and pewter Wendell August giftware by dusting it with a soft cloth. To remove any light surface scratches and add shine to your piece, use a soft cloth and dish soap and dry it immediately again with a very soft cloth after cleaning completely. Make sure you go with the grain (or fine lines which go from left to right) of the metal as this soft cloth will help polish the item. The longer it is polished the greater the sheen. Aluminum and pewter will dull or darken with age, especially if it isn't used. Under normal use and care, your aluminum and pewter pieces should last for several generations. For deep scratches and badly marked pieces, we do offer refinishing on Wendell August pieces in your collection. Please call customer service at 1-800-923-4438 for more information. Note: Any Wendell August piece can be damaged if cut on, used as an ashtray or put in the dishwasher. How do I take care of my Bronze, Copper or Sterling Silver Wendell August piece? Each piece of our bronze, copper and sterling giftware is covered with lacquer finish to prevent the piece from tarnishing. This coating will be damaged if subject to heat (especially hot water) and harsh chemicals. Once the lacquer is penetrated, the item will tarnish (usually dark spots appear). Therefore, we recommend that any piece with a lacquer finish be used only as a display piece. To dust or remove any smudges or fingerprints, hold the piece with a soft cloth and gently wipe it clean with a second soft untreated cloth. However, for those who do wish to use your Wendell August pieces for serving, we recommend one of our convenient Tray Protectors, shown in our product section, or use a piece of plastic wrap over the item before placing food on the piece. All Wendell August pieces should be used for serving "cold" items only (cookies and sandwiches). However, if serving cake with icing or cold cuts and cheese, a protector is a good idea. Can my Wendell August pieces be washed? Your aluminum and pewter Wendell August pieces may be rinsed in plain, warm water and gently wiped dry immediately with a soft cloth. DO NOT put through the dishwasher. Your bronze, copper and sterling silver pieces should NOT be washed. This includes hand washing and in the dishwasher. These metals have a lacquer finish (to retard tarnishing) and water will penetrate the lacquer. These items should NOT be used for serving pieces, or as ashtrays, as the heat will penetrate the lacquer. Once the lacquer is penetrated, the item will tarnish (usually dark spots appear). You may dust these metals with a soft untreated cloth.